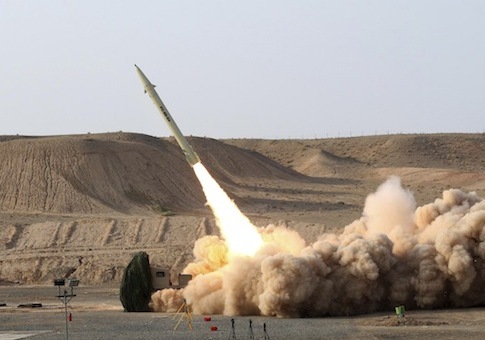 U.S. intelligence agencies recently detected Iran conducting a static ground test of a large rocket motor that could be used for a future intercontinental ballistic missile (ICBM), according to U.S. officials. Disclosure of the recent rocket engine test comes as Congress is prodding the Obama administration to deploy a third ground-based missile defense interceptor base on the U.S. East Coast. "This engine could be used for an ICBM," said one official familiar with the intelligence reports of the test. No other details were available. A Defense Intelligence Agency spokesman declined to comment on the test. However, the Pentagon and civilian U.S. intelligence agencies have been closely tracking the Iranian missile program and are concerned with Tehran’s drive for a missile capable of reaching the United States. The Pentagon’s annual report to Congress on the Iranian military said the Iranians are continuing to build missiles that can reach Israel and Eastern Europe. "Iran may be technically capable of flight testing an intercontinental ballistic missile by 2015," the report said. It also stated that Iran’s development of space launchers would assist in building ICBMs. "Since 2008, Iran has launched multistage space launch vehicles that could serve as a test bed for developing long-range ballistic missile technologies," the report said. A recent International Atomic Energy Agency report on Iran’s nuclear programs said the agency has questions about Iran’s work on a nuclear payload for a missile. The House version of the fiscal 2014 defense authorization bill provides funding for development of an East Coast missile defense site to counter Iranian long-range missiles. The East Coast site, possibly to be built at military bases in New York or New England, would complement two current missile defense interceptor bases in the western United States, at Fort Greely, Alaska, and Vandenberg Air Force Base, Calif. Locations mentioned for the site include the Army’s Fort Drum, New York, base, the former Griffiss Air Force Base in Rome, New York, and a site in Caribou, Maine. The Pentagon’s budget request contained no funds for the East Coast site, as the Pentagon is opposing the facility. "The committee believes such a site is critical to the defense of the United States," the House report on the defense bill stated. "The committee is concerned that funding for the [East Coast interceptor site] process to implement section 227 is not included in the budget request, and notes that the Missile Defense Agency intends to treat it as an unfunded requirement." The House bill would provide $210.6 million for the missile defense site. Pentagon officials have told Congress there is "no validated military requirement to deploy an East Coast missile defense site." However, the Pentagon recently canceled its planned Phase 4 of European-based missile defenses that included a SM-3 interceptor variant capable of hitting Iranian missiles fired at the United States. The plan was canceled amid pressure from Moscow to restrict U.S. missile defenses in Europe. A group of Republican House members, led by Rep. Howard "Buck" McKeon (R., Calif.), wrote to Defense Secretary Chuck Hagel in March that the cancelation of a European-based missile defense interceptor "creates a large capability gap to defend the United States from Iran." The lawmakers said "it appears Iran could flight test an ICBM this year." "Yet, with the cancelation of the SM-3IIB missile, even with the deployment of 44 [ground based interceptors] in Alaska and California … there is a large gap in the missile defense of the United States against the Iranian threat," the 19 House members stated. Michael Elleman, a former U.N. weapons inspector and author of the book Iran’s Ballistic Missile Capabilities, stated in a recent article that the Iranian space program is critical in building powerful booster rockets and other skills that could be used in developing longer range missiles, including ICBMs. The main space launcher is the Safir that in 2009 launched an Iranian satellite into space. "It demonstrated a new sophistication in multistage separation and propulsion systems," Elleman stated in an article published by the U.S. Institute of Peace. Another space launcher is called Simorgh and it was displayed for the first time in 2010. The Simorgh uses four short-range missile engines that are clustered to create a booster stage. Classified U.S. assessments of Iran’s missile program were disclosed by Wikileaks, which posted several State Department cables prepared for the international forum on the Missile Technology Control Regime, an export control group that seeks to prevent missile proliferation to rogue states. A Sept. 23, 2009, cable said "Iran has established an SLV [space launch vehicle] program that complements and advances its missile development," the cable, labeled "secret," stated. "Although currently the Safir is restricted to very small payloads, Iran’s ability to place a satellite into orbit has demonstrated several technical capabilities applicable to longer-range ballistic missile systems, including staging, clustering small engines, and using gimbaled engines for control of the Safir’s second stage," the cable said. "As such, Iran’s SLV program remains a key concern, as many technologies required for this program will directly benefit Iran’s long-range ballistic missile development efforts." A National Research Council study made public last year on U.S. missile defense efforts stated that an Iranian ICBM with a liquid fuel rocket motor launched from central Iran to the U.S. East Coast would burn for about 250 seconds during its initial "boost-phase" and a total flight time is about 40 minutes. A solid-fuel Iranian ICBM launched from the same location would burn for 180 seconds during boost phase. The report recommended building an additional missile defense interceptor site in the continental United States to counter the missile threat likely to emerge from North Korea or Iran over the next several decades. A 2008 State Department cable said: "Tehran could attempt to develop and test much of this [long-range] missile technology under the guise of a space program." A third cable said North Korea has provided assistance to Iran’s space launcher program, a fact U.S. intelligence said "suggests that North Korea and Iran may also be cooperating on the development of long-range ballistic missiles."